The Curse of King Tut is considered to be one of the world's greatest unsolved mysteries. While the public's view of the curse, originated in the western civilization, upon the excavation of King Tut's tomb, it was not new to the Egyptians culture. In ancient times in was common that a curse would be placed on the tomb to protect the Pharaoh from desecration. This is because every item placed in a tomb was meant to assist the Pharaoh in the afterlife, so any removal of the items would hence remove assets essential to the needs of the Pharaoh in the afterlife. So, the Curse of King Tut was not the first known curse. The one question that has baffled hundreds, even thousands for close to a century is, "Does the curse of King Tut really exist?" The evidence is astounding and the stories are legend, but does the curse actually exist. 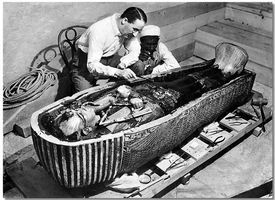 Let’s start in 1922, when the wealthy Englishman, Howard Carter, discovered the tomb of King Tutankhamen. A cobra, one of the guardians of the tomb, supposedly killed Howard Carters pet canary on the first day of the excavation. Then in 1923 only a couple of months after uncovering the chamber of King Tutankhamen a man by the name of Lord Carnarvon, who was funding the dig, was bitten by a mosquito. This bite was later cut while shaving causing blood poisoning, followed by his death shortly after. At the precise moment of his death the lights of the hospital went out. It is said that his dog Susie was found howling and dropped dead on the same day as Lord Carnarvon. Were they just coincidence, or was it the act of the curse. This is where the unsolved mystery lies. As legend goes, a sailor, while in Egypt, gets involved in a poker game and wins a scarab from King Tut's tomb. His plan is to give it to his daughter as a birthday present upon returning home. After giving the gift, he leaves home again and becomes lost at sea. Only days after receiving the scarab, the girl falls ill. She is diagnosed with leukemia and dies shortly thereafter. Her mother, feeling that the scarab had brought bad luck, sells the scarab. The new owner of the scarab also provides it to her daughter. She, too, falls ill within a few days, is diagnosed with leukemia, and dies. After that, the mother does research on the scarab and discovers that it was from King Tut’s tomb. From there, it is not certain whether she discarded the scarab or donated it to a museum, but that is an unsolved mystery for another time. Some claim that the curse is a hoax, and there is a scientific explanation for all of it. However, the only scientific explanation they can give is the presence of mold spores, and the deaths that resulted were caused by an allergic reaction. However, mold spores do not explain the death of Howard Carters canary by a cobra, nor the death of Lord Carnarvon by blood poisoning, nor the unrelated two little girls that were never at the site and died from leukemia after only coming in contact with a scarab from the tomb, nor the father of the first little girl being lost at sea. While the curse of King Tut will remain an unsolved mystery, what do you believe?